As a digital marketer, I have an innate bias towards the benefits of digital marketing, but for good reason. Traditional marketing has its own benefits, but they fall short when compared to digital marketing strategies. No longer can marketers get by only relying on print ads, broadcasts, direct mail, or telemarketing. Consumers are spending more time in the digital space than ever before. This has opened up an arms race in the digital realm for companies to get their message in front of their target audience before their competitors can get to them. Traditional marketing, or the more proven marketing strategies that are not associated with the Internet, are simply not enough. Marketing has now evolved to a point where it includes email, social media, website content, and much more. Furthermore, companies who are more effective than others at speaking to their targeted audience will be more successful than their competitors. The rise of the digital world has given us all more information literally at our fingertips. Consumers use this new technology to be more educated on their purchases, and often submit their contact information for something they perceive as valuable. Companies with the ability to supply a valuable piece of content can generate marketing qualified leads, sales qualified leads, and boost their sales teams’ ability to close. For example, an employee who works in the cyber security industry would be interested in giving their own email, job title, and company name in order to register for a webinar where a specific cyber-attack is discussed. And the more effective digital marketers will utilize email marketing and social media to boost the appeal of that specific marketing tactic. People who aren’t doing at least one of those above things will not be taken seriously. One author states the importance of having a website… in an article written in 2004. Twelve years later, with the extreme growth of social media sites like Facebook and Twitter, and other digital services, digital marketing has become the norm, while traditional marketing has become less essential. While traditional marketing strategies have been proven to be successful, digital marketing allows us to go to where the consumers are. Strategic targeting for traditional marketing was only as sophisticated as hoping the audience for a certain magazine, radio, or TV show hits your ideal consumer. With digital marketing, we can target by a person’s job title, income, physical location, and much more. Furthermore, we can track those people as they gain interest and move from being aware of your company, to wanting to make a buying decision on one of your products. In addition, traditional marketing has shied away from the wants of the consumer, in that certain companies that don’t have it possess a competitive advantage. Amanda Daume, an Inbound Marketing Strategist elaborates. Those companies and online tools like Adblock exist for a good reason; because traditional marketing strategies are getting annoying. Netflix and Sirius XM skip over the commercials, and Adblock blocks the annoying pop-ups and sidebar ads. Users have clearly demonstrated their desire to not be exposed to traditional marketing through the companies’ and program’s popularity. 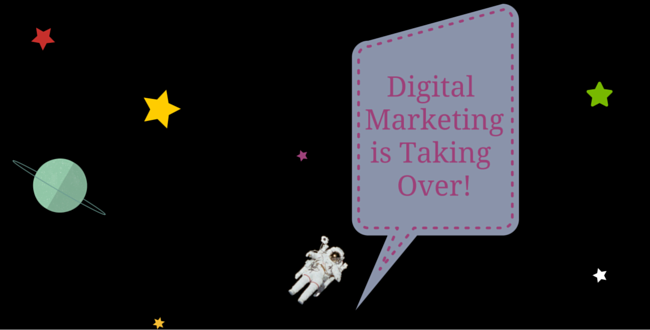 There is no denying digital marketing is becoming the new norm when it comes to marketing practices. Traditional marketing doesn’t provide as much value to consumers as digital marketing does, especially when accounting for the rise of digitally capable devices. Don’t let your competitors get ahead in the digital marketing realm. Contact us to see how we can help you.